My goal is to provide parts, service and technical support for the continued operation and enjoyment of the wonderful cars made by Austin Rover and imported to the USA as Sterling. These cars were imported for 1987, 1988, 1989, 1990 and 1991 model years. In 87 and 88 they were badged as 825S and 825SL. In 89 there were the 827S, 827SL, 827SLi. in 90 and 91 they produced the 827SL, 827Si and the 827SLi. All these cars had 4-doors and the SLi had a rear hatch instead of the trunk which the sedans carried. I have personally worked on hundreds of these fine cars. I especially enjoy diagnosing electrical and drivability problems. I currently have more than 75,000 new parts listed in my inventory. I have also dismantled more than a dozen cars to keep parts on hand which are currently unavailable. I currently drive a 91 827SL and have owned numerous others. 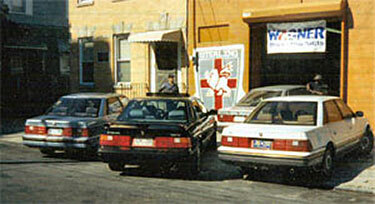 For 13 years I operated a full service repair shop in Brooklyn, NY where I earned my ASE Master Tech certification. In April 2007 our family moved to the agrarian community of Bainbridge, PA and started operating a 42 acre farm. We are quite busy in the summers with hand harvesting acres of sweet corn, watermelons, tomatoes, okra, lima beans and other crops. There is a warehouse on the property from which we ship parts to all the US and to foreign countries as needed. We have our own workshop where we repair/restore Sterlings over the winter season. I am glad to answer your questions as time permits. Feel free to call me for questions about parts availability, repairs and technical issues.